Storing and Moving your Collection – MoonFigures Collection, Art, and Reviews! Chances are when you have a growing collection you’ll find yourself storing boxes, items of lesser importance, or items you just can’t display right now. It’s difficult to know exactly how you should do that when you’ve never had to before, so hopefully I can provide some tips you didn’t consider. As storing and moving can go hand-in-hand I’ll attempt to cover specific products/methods individually. There are no rules… these are just things I’ve done myself, or have read about. Funny enough, one of the best ways to store your item is exactly how you received it! In the manufacturers packaging. As most of the packaging will probably be cardboard I recommend storing your items in a cool, dry place. You can stretch wrap the box, or tape paper towel around it for extra security from dust or spills (use the stretch wrap). This is not a permanent storage solution for figures! PVC and ABS figures are known to “sweat” in their boxes. The plastic will feel oily or sticky. This can be washed off with a damp cloth, but be sure to take extra care. Figures are not meant to be placed in water, or spend time wet. It may cause issues with the paint if you are careless. If you don’t have the manufacturer’s box then a regular box will do. Stuff it with plastic shopping bags, packing paper, or paper towel to support the item so it doesn’t break. THE MORE ITEMS IN A BOX THE MORE POTENTIAL THERE IS THAT SOMETHING WILL MOVE AND BREAK. So limit your glass items to 1 item per box unless you super pad it. Zip Lock baggies are PERFECT for small items with multiple parts like gashap on. They take up very little space, can be flattened, and contorted to fit into small spaces, plus they can be sealed in order to keep the contents in the bag without difficulty. They’re also available at the dollar store in standard sizes, or various sizes online for very cheap. Be sure to choose a Zip Lock bag that is not meant for freezer usage or mentions anything about preserving food for long lengths of time. I’ve read about acidic properties in the plastic causing damage to the paint and plastic of figures that are stored for long periods of time. As regular Zip Lock bags shouldn’t be an issue, I imagine it is the bags with special preservative properties that are the problem. A bag designed to avoid freezer burn, or other issues could have additives in the plastic that protect something like food, but damage plastic or paint. For safest, and flattest storage be sure to disassemble your gashapon or item (if possible). Sometimes you’ve got nothing else! Use a paper (or cotton) towel to wrap your figures, stuff, and secure the small areas. Tape around them when you’re happy with the amount you’ve wrapped and secured it. Paper towel is great if you’re moving or storing for long periods. Cotton or regular towels/blankets are fine temporarily… mostly because you’ll probably want that in the shower eventually. Stretch wrap products like Saran Wrap should be treated like zip lock bags. For long-term storage seek options that aren’t meant for preserving frozen food. For anything temporary it shouldn’t matter too much. Stretch wrap is great for soft items like plushies, or even dolls. You can also wrap them in a single layer or two, pull it tight, and neat around the plush, and display them that way to avoid dust, and smoke damage. My parents use to wrap the plastic loose, but neatly around my porcelain dolls and create doll bags for them for the same reasons. A perfectly acceptable choice of storage is, well, in a storage container. Rubber Maid makes a lot of great, sturdy choices, and I highly recommend using them. They will keep your stuff mostly safe from water and potential hazards. To take full advantage of them either use the manufacturer’s box, or an alternative to safely secure the item (read above). Pack nicely into the box and there you go! I also like to stuff mine with cotton or paper towels to keep the items from bumping around, and denting or breaking things. Mothballs are a bit questionable. They SHOULD be ok to store in your containers to keep your boxes safe, but there are many controversies over the potential health risks of using mothballs. If you are someone who uses them I recommend it, but also recommend researching the risks (especially if you have children). If you don’t use them, well, I don’t need to tell you twice. If you’re into comics you probably already know about, or have seen comic boards and bags. These are standard comic sized boards you place behind your comic, and then place into the accommodating (but sold separately) sized bags. 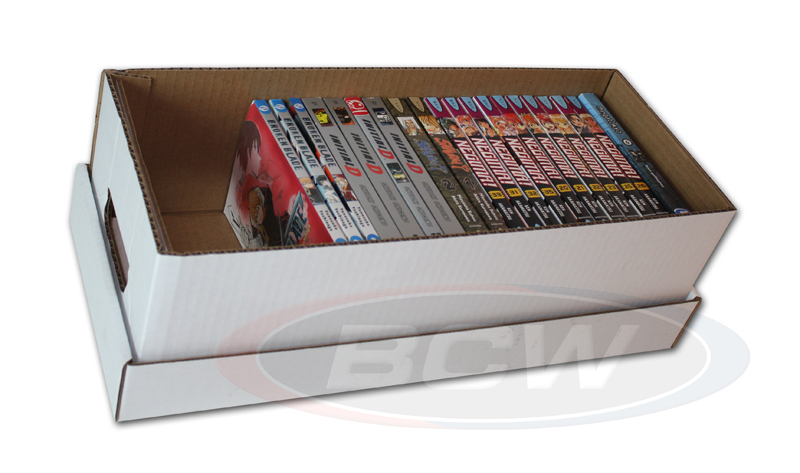 This not only protects them from damage, but makes them easier to store on shelving, or in a comic box. But did you know that these same items exist for standard books and manga? They don’t typically need back boards though, since they’re usually sturdier. You can buy manga, book, and comic bags here, or most likely at your local comic shop. For books that you can’t buy a standard size bag for you can also use shrink-wrap! Shrink-wrap can be purchased at most local hardware, or office supply stores (my Staples carries it!) but I do not recommend using their heat guns unless you know for sure it isn’t hot enough to damage the glue binding the book together. Your hair dryer should work as well (but still be careful of the glue). A shrink-wrap system can cost a lot of money, but for long-term storage it’s a good solution, AND it can be used for more than just your books. Have questions about the items you own? Comment below and I’ll respond with a suggestion, as well as add it to the article.